Ensuring Speed and Quality in application development is absolutely essential for all kinds and sizes of enterprises. Test Automation has been considered and adopted by substantial number of enterprises and teams working on time bound and business critical applications. 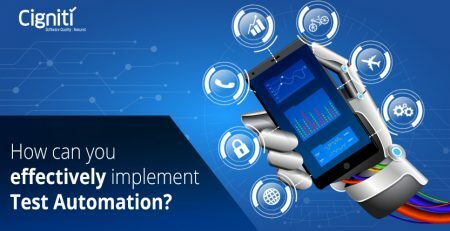 The challenges thrown by Digital Transformation can be managed with an effective Test Automation strategy with a result-oriented approach. 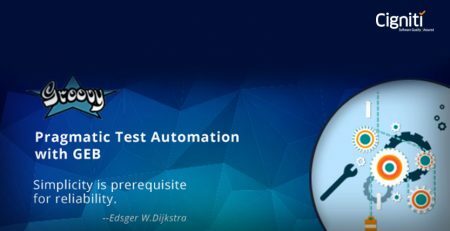 While automation of tests is extremely critical for continuous delivery and deployment, it is very much essential to understand the burgeoning challenges that industry folks face while considering the Test Automation approach and practically implementing it. What are the practical challenges while implementing Test Automation? Enterprise applications have to deliver on a lot of parameters and the expectations keep going high every time. New and emerging technologies are creating a lot of opportunities, but at the same time posing a lot of challenges as well. We have put together some real-time challenges that teams face while considering and implementing Test Automation for enterprise applications. Test Automation needs investment, efforts, and skills to implement the tools and frameworks effectively. Hence, there are a lot of areas that must be covered to ensure full confidence and consent for adopting Test Automation – Time-to-market, Test Coverage, Accuracy, Security, Performance, Functionality, etc. The challenge is to get all the parties to buy in to the idea of automation for which a strong business case is needed. The solution is to ensure transparency and put across the actual requirements to the stakeholders. This makes the first step strong and confident, resulting in effective decision making. If not implemented effectively, Test Automation can create chaos and disrupt the testing and development activities. Hence, it is critical to choose the right tool that aligns with the business objectives and fits into the exact requirements of the project. For instance, if the focus is on ensuring an application’s security, automation might not be needed for ensuring performance of the application. If you choose the right tool, you have almost accomplished half of your project objectives. Now that you have selected a relevant tool, you need to build a relevant strategy for application development. The challenge is to get started on the automation strategy. With practices such as Agile and DevOps pouring in, there is nothing like consistency and predictability in the testing process. Hence, the strategy has to be built on the fundamentals of risk-based testing and business-driven testing objectives. The priority has be on the features that could fail first and need a fix. This will help teams to analyze the business impact of the risks, its financial impact, and gauge the probability of failures. After substantial investments and training, it is absolutely critical to set goals that can be achieved and make the process more result-oriented. This will help teams to achieve maximum test coverage and bring velocity to the testing and development activity. Additionally, it will also give an idea on which tests can be automated and which cannot be automated. It will help to identify glitches much earlier in the day than towards the end. A strategy cannot be made by just implementing the tools, it is made by implementing the tools effectively with required skills and thought process. For instance, there are tests that cannot be automated and need manual intervention. These decisions are absolutely critical while building the test automation strategy. Hence, all this requires right information, analytics, and skills to make the best possible decision and ensure quality to bring speed to the entire process. By leveraging Cigniti’s enablers and the assets developed by the ACoE, organizations have reduced efforts in developing test automation framework by over 80%, saved more than 50% in test automation script development efforts, and realized over 70% reduction in overall regression testing efforts. Cigniti utilizes proprietary test techniques to identify automatable manual tests. Cigniti’s test automation methodology (and team) is well accustomed to Agile and DevOps environments ensuring consistent ROI during the entire agile lifecycle. 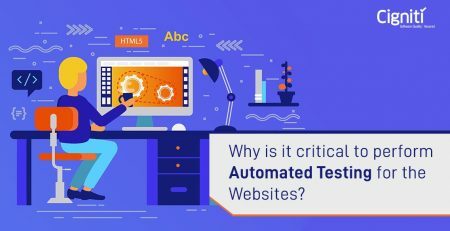 Why is it critical to perform Automated Testing for the websites?